This book uniquely combines cutting-edge medical, psychological, and sociocultural topics pertinent to eating disorders. In the medical realm, the book focuses on Eating Disorders' newly investigated associations with ADHD and sleep disorders, and on innovative treatments of osteoporosis in anorexia nervosa. Novel contributions in the psychological realm address families' trans-generational transmission of Eating Disorders-related difficulties and novel internet-based treatments for such families. Lastly, in the sociocultural realm, the book discusses social contagion and Pro-Ana websites as increasing risk for disordered eating in young women around the globe. This volume provides readers with more holistic perspectives of each realm and their interplay, to promote Eating Disorders' understanding, treatment, prevention, and research. It provides various professionals including mental health providers, physicians, nutritionists, and graduate students in these professions. Introduction.- Chapter 1. 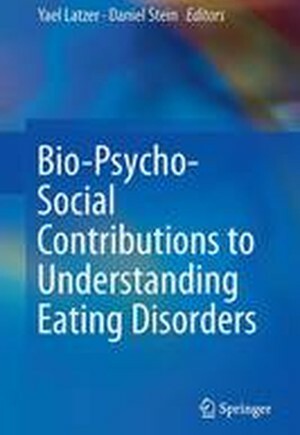 Bio-psycho-social Contributions to the Understanding of Eating Disorders; Yael Latzer and Daniel Stein.- Part I. Medical Issues.- Chapter 2. Attention Deficit Hyperactivity Disorder and Binge Eating: Shared Phenomenology, Genetics and Response to Treatment; Allan S. Kaplan, Andrew L. Howlett, Zeynep Yilmaz and robert Levitas.- Chapter 3. The Interplay between Eating and Sleeping Behaviour in Adolescence: Normative and Disordered Trajectories; Yael Latzer, Sarah L.Weinberger-Litman, Leib Litman and Orna Tzicshinsky.- Chapter 4. Endrocrinopathies of Eating Disorders; Nehama Zuckerman-Levin, Ze'ev Hochberg, Patricia E. Dunne and Yael Lazter.- Chapter 5. Skeletal Involvement in Eating Disorders; Nehama Zuckerman-Levin, Yael Latzer, Patricia E. Dunne, and Ze'ev Hochberg.- Part II. Psychological Issues.- Chapter 6. Eating Disorders and Suicide; Lisa Lilenfeld.- Chapter 7. Mothers with Eating Disorders: The Trans-Generational Transmission of Emotional Difficulties Related to Disordered Eating; Shiri Sadeh-Sharvit, Rachel Levy-Shiff, Anca Ram, Eitan Gur, Eynat Zubery, Evelyne Steiner, David Rabinowitz, Maayan Zusman, Michael Eines and Yael Lazter.- Chapter 8. Giving 'Til it Hurts: Eating Disorders and Pathological Altruism; Rachel Bachner-Melmanand and Barbara Oakley.- Chapter 9. Women with Eating Disorders and a History of Sexual Abuse: An Integrative Treatment Approach; Eynat Zubery, Yael Latzer and Daniel Stein.- Chapter 10. Interpersonal maintaining Factors in Eating Disorders: Skills Sharing Interventions for Carers; Janet Treasure, Ans R. Spulveda, Wendy Whitaker, Carolina Lopez, Maria Zabala, Oliva Kyriacou and Gill Todd.- Part III. Sociocultural Issues.- Chapter 11. Emotional First Aid in Eating Disorders: The Unique Role of Hotlines and Online Services; Itzhak Gilat and Yael Latzer.- Chapter 12. The Characteristics of Pro-Ana Communities; Meyran Boniel-Nissim and Yael Latzer.- Chapter 13. Spiritual Self Starvation En-Route to Salvation; Eliezer Witztum, Daniel Stein, Yael Latzer, Moshe Kalian.- Chapter 14. The Influence of Religious Orientation and Spiritual Well-Being on Body Dissatisfaction and Disordered Eating in Jewish Women; Sara L. Weinberger-Litman, Laura A. Rabin, Joshua Fogel and Janet L. Mensinger.